OctConf 2015 will take place in Darmstadt, Germany for three days from September 21 until September 23. Please email Sebastian or Jacopo if you think you could attend. Also write your name below in the Participants section if you think of attending with high probability. Talk on using the profiler in Octave. The shown demo code is also available. An overview of the Octave Forge project, what it provides, and discussion of its future. A tutorial on writing your own Octave packages, from simple collections of m files to all the extra optional files. Tips for improving performance of user scripts. Octave software for research on Isogeometric Analysis. Very basic overview of the Octave Forge package on real valued interval arithmetic. For further reading, please consult the package documentation . Also some general experiences with development at Octave Forge. We discussed about our future relation with the "Summer of Code" programs (Google, ESA, etc.). What percentage of students stays within the community? What is the quality of their contributions? The fund raising at OctConf yielded a $700 donation for GNU Octave on Oct 2, 2015 (Transaction ID 7P725701GD802890U). Darmstadt is a medium sized German city (154.002 inhabitants, cf http://www.darmstadt.de) located in the close neighborhood to Frankfurt, i.e., easy to reach due the airport FRA. It is one of the few cities in Germany that are allowed to call themselves "city of science". The reason is that Darmstadt has clearly dedicated itself to academia and research:, it has a technical university ("TU Darmstadt", founded in 1877) and two universities of applied sciences "h_da" and "Evangelische Hochschule" with 40,616 students in total. Furthermore there are several research institutes, e.g., the European Space Operations Centre, EUMETSAT and the GSI Helmholtz Centre for Heavy Ion Research, which discovered with their heavy-ion accelerator chemical elements like Darmstadtium. Many technology companies are also located here, e.g. big cooperations like Deutsche Telekom, Merck but also SMIs like CST which is a spin-off of TU Darmstadt and the market leader for high-frequency electromagnetic field simulations. 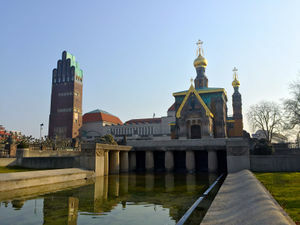 In former times Darmstadt was the seat of government of the German State Hessen and thus has still an active cultural life and in particular important architecture from the beginning of the 20th century. The dukes of Hesse were at that time interested in art, in particular the so-called Jugendstil (the German version of Art Nouveau) and funded the Darmstadt Artists' Colony. It is still located at the Mathildenhöhe. The institution has been recognized as a center for top-level research and scientific excellence by the highly competitive 'Excellence Initiative' of the German Federal and State Governments. 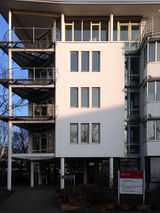 The Graduate School enables PhD students to develop their scientific skills in a focused way, and to cooperate under optimal conditions in a highly stimulating interdisciplinary environment (computer science, engineering and mathematics). One lecture hall and two seminar rooms with wifi (eduroam) are reserved for the whole week. You can find travel directions here. The recommended procedure is a flight to Frankfurt's International Airport and then taking the bus called "Airliner" to Darmstadt main station. Frankfurt Hahn is also an option but is approximately 130 km away from Darmstadt and there is no direct connection. To get from Hahn to Darmstadt the best way is to take the bus to Frankfurt Hbf, get off at Frankfurt's International Airport stop and take the "Airliner" from there. The conference hotel (see below) is directly at the train station and the venue in 15min walking distance. September 21-23, 2015. This is from Monday to Wednesday. Participants are encouraged to attend for all three days, but anyone is welcome for any duration of time. If necessary, invitation letters can be issued. Excursions for the technology enthusiasts to ESOC, EUMETSAT and/or GSI are planned. Code sprints and informal discussion will happen every day. Please propose topics of interest for these sessions. 10:15-10:50 Octave and Python: Don't Call it Pytave! Show us what you do with Octave and any interesting application in your field. Please email us if you are interested in contributing so that we can schedule the number of participants. The official registration period is now over. Participation to the conference is still possible without official registration, but we cannot guarantee hotel reservations, food or the possibility to join the social program. TU Darmstadt is a family friendly university. If you are planning to attend OctConf with your family/children please contact us. We will be happy to help you to organize child care. There is limited funding to cover the travel expenses of selected participants. The available funds have currently been assigned. All participants are compilers of Octave themselves.The main reason for them to participate to the conference is their interest in the development of Octave Core. Besides that also meeting the other developers in real life seems to be a motivation to join. The desired timespan for the conference is for almost all the participants 3 days. The amount of talks was to all participants adequate. 43% of the participants would like to have more code sprints for 57% the amount of sprints were adequate. Everyone liked the excursions, however 4 out of 14 participants thinks that the amount was too high. The poster session was appreciated by all participants and there is a slight request to extend it. There is also a request to define specific goals before the conference. The most proposed tool to share those goal is the wiki. About the financing of the conference: 8 of 14 participants do not care where the money is coming from. For those who care, they want the contribution of the conference fees to the financing as low as possible. For the other contributions there is no clear line. 10 out of 14 participants loved t-shirts and half of them thinks that we should stuff like this. This page was last edited on 28 February 2017, at 02:23.